Members of the CBW Boys Lacrosse team helped out a local family by donating their time and physical labor to clean their yard of leaf litter. The boys worked diligently and efficiently to make quick work of the job and the effort was appreciated by the family going through the stress of medical treatments. Well done boys and Go Bucks! 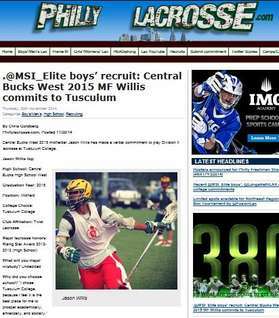 Congratulations to Senior Jason Willis on committing to Tusculan College! Congratulations to senior Jason Willis committing to continue his career at the next level at NCAA Division II Tusculum College in Tennessee! Your CBW lacrosse family is proud of you and your decision to play at the next level. 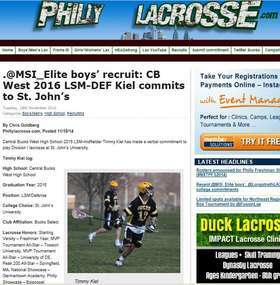 Congratulations to 2016 Tim Kiel on verbally committing to St. John's University! Congratulations to junior Tim Kiel on committing to play NCAA Division I lacrosse at St. John's University in New York. He will join his brother Patrick in 2017, currently also committed to play there. We are proud of your decision to play at the next level! A very big congratulations to senior Pat Kiel and family on his official commitment to St. John's University and to Clark Hawes and family on his official commitment to the University of Tampa. Your Central Bucks West lacrosse family is very proud of your decision and commitment to continue your career at the next level.